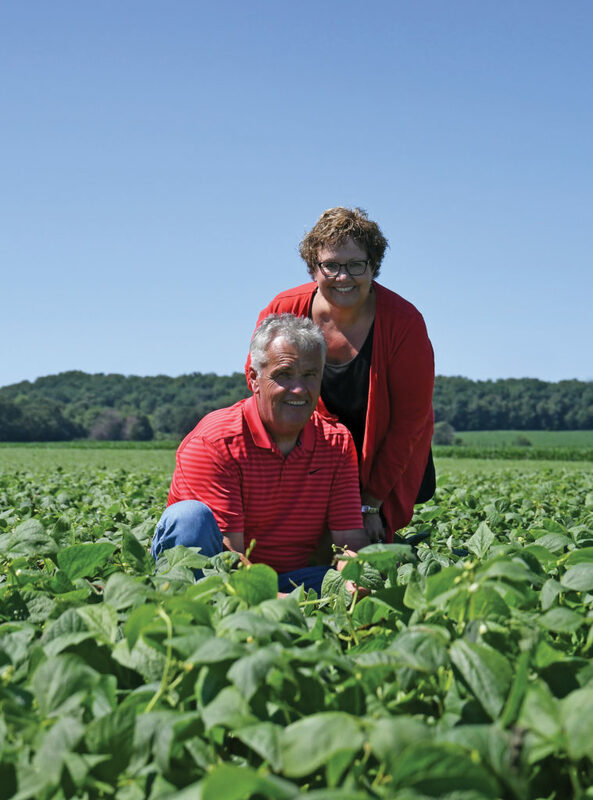 Kidney beans may not be the first commodity that comes to mind when thinking of Wisconsin agriculture, but for Dunn County Farm Bureau board member Dale Quilling and his wife, Cindy, they are. 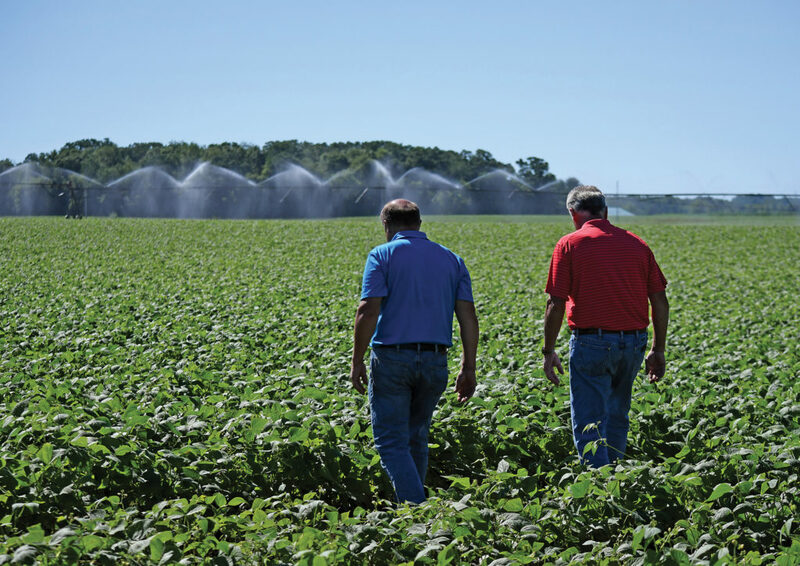 Dale and his brother, Bruce, farm 1,800 acres of corn, food-grade soybeans and dark red kidney beans in Menomonie. Kidney beans are typically planted in mid-May and it takes 14 weeks for the plants to reach full maturity. Similar to soybeans, the plants flower in mid-summer and develop pods that contain three to six beans. The green plants will turn golden as the fall harvest approaches. Prior to combining, the beans are pulled and windrowed. The combine removes the dried bean pod from the plant and separates the beans from the pod. Bruce (left) and Dale shared stories about past challenges and successes on the farm. Dale and Bruce process the beans by putting them through a fanning mill to remove the dirt and debris. The process is finished when the kidney beans travel over a gravity table to be sorted for the removal of foreign material, stones and broken or discolored beans. The final step is loading the beans into 2,200-pound tote bags that are sent to the canning company. The Quillings market their kidney beans through Chippewa Valley Bean Company in Menomonie. 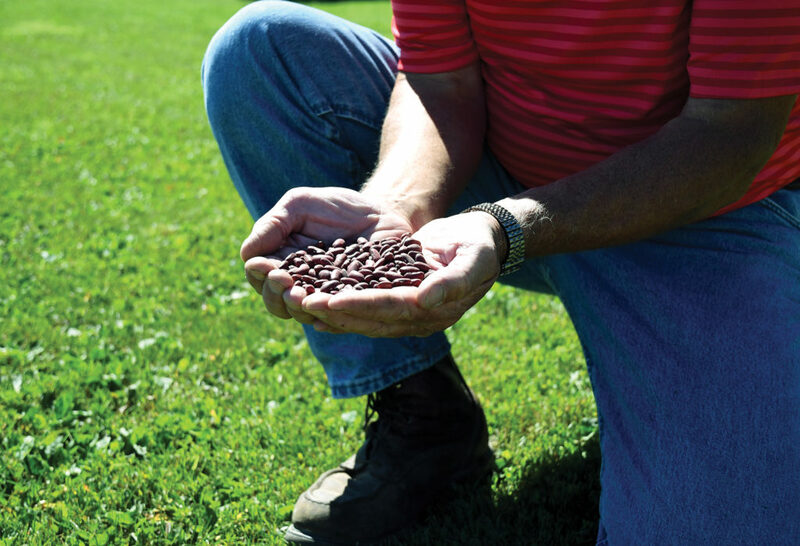 Nearly 70 percent of Chippewa Valley Bean Company’s kidney beans are exported to 24 countries. Similarly, the food-grade soybeans are marketed through SunOpta, a specialty food company based in Hope, Minnesota. The Quillings’ soybeans are sold to the Asian market for tofu. SunOpta researches the characteristics or varieties that are desirable to their end users and, in turn, contracts with growers like the Quillings to meet those demands. The Quilling brothers grew up working alongside their father on the family farm near Menomonie. “My father taught me the value of hard work and provided guidance in setting up the next generation to farm,” said Dale. 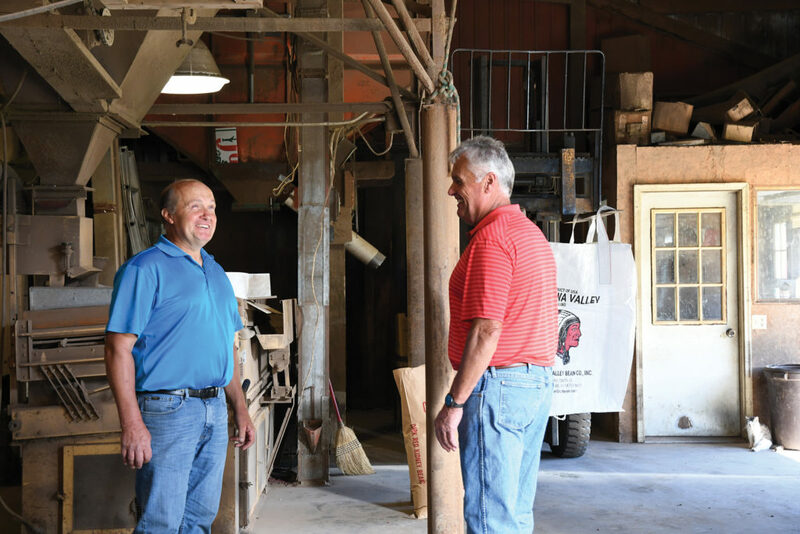 When their father was ready to retire, Dale and Bruce transitioned into ownership roles. In 2008, the brothers formed Quilling Farms LLC. 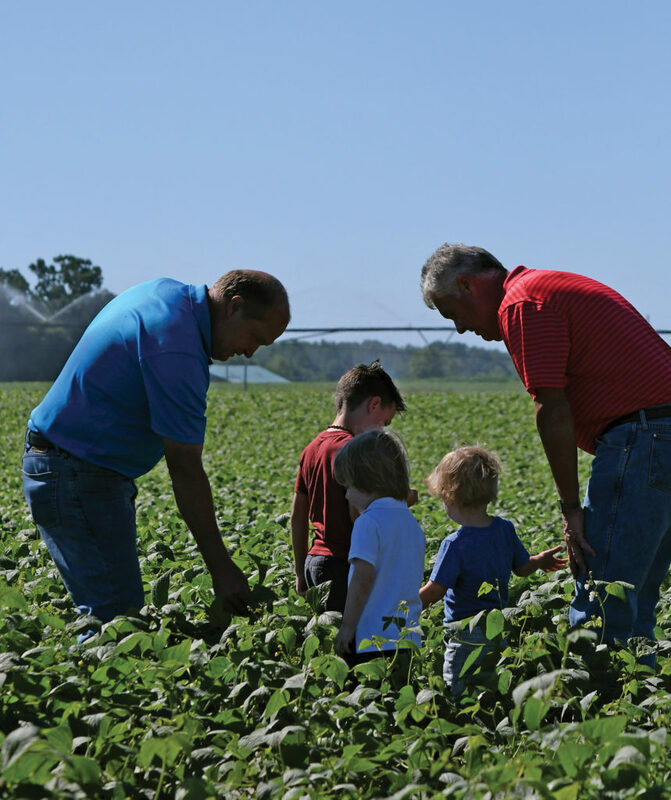 Even after retirement, Dale’s father played an important role on the farm as each day began at the breakfast table with Dale, Bruce and their father talking about managing, marketing and operating decisions. Dale’s father passed away unexpectedly in June, and the family is still working to find a ‘new normal’ on the farm. 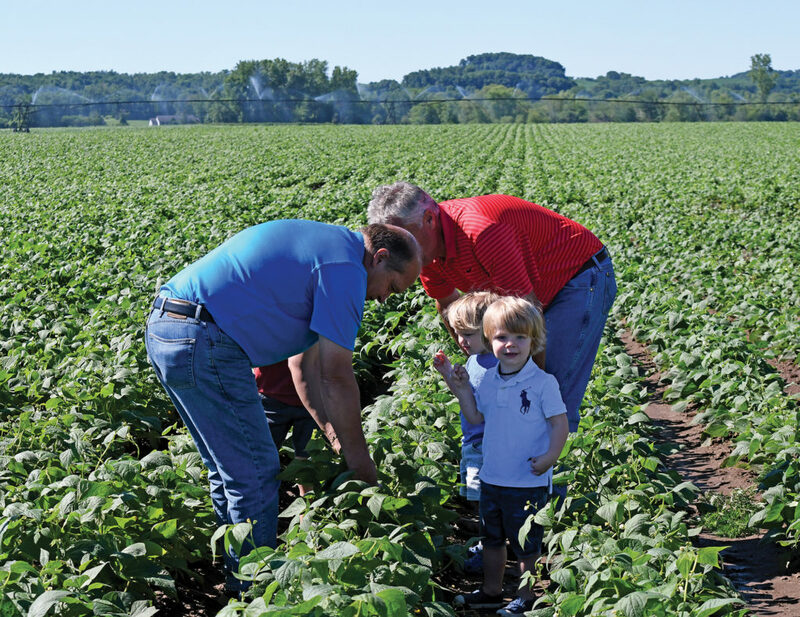 Dale pictured with his three grandchildren and brother Bruce in a kidney bean field. Family has always been an important part of Dale’s life and being a farmer allows for unique family memories. Cindy also grew up on a farm and their two adult daughters, Brooke and Ashlee, are still connected to agriculture. Brooke is a nurse at a hospital in Woodbury, Minnesota. She and her husband, Chris, own Bowen Milk Hauling and deliver milk to Ellsworth Creamery. The couple has two children, Beckett and Blair. Ashlee is a kindergarten teacher in the Boyceville School District and her husband, Eric is a herd manager at Denmark Dairy in Colfax. The couple has one child, Dane. “The most rewarding part of my job is seeing the excitement of my grandkids when they want to ride in the tractor with grandpa,” Dale said smiling. When the Quillings’ children were in elementary school, the couple presented kidney bean information to their classrooms. The family knows the importance of talking about the product they grow. In the classroom, Dale spoke on the business side of growing kidney beans using a globe to emphasize where they are shipped to. Cindy talked about the nutritional value while giving them samples of chocolate cake made with kidney beans. While Dale knows consumer connection is important that doesn’t stop his frustrations with misconceptions. One of Dale’s least favorite misconceptions about agriculture is that genetically modified organisms are unsafe. Dale credits Farm Bureau with being a voice in helping consumers connect with farmers. Specifically, the Wisconsin Ag in the Classroom program that makes the connection for students and teaches them how food gets from the farm gate to dinner plate. Dale has been a Farm Bureau member for 35 years. He appreciates the legislative voice the organization provides and educational opportunities. As a Dunn County Farm Bureau board member for 20 years, Dale has had memorable experiences including attending the American Farm Bureau Federation Annual Convention in Charlotte, North Carolina. Story by Sarah Marketon. Original version appeared in the August|September 2018 issue of Wisconsin Farm Bureau Federation’s Rural Route. Great story about a wonderful Farm family. The Quilling are the kind of people that help others in the community and share the positive side of agriculture.